A blend of Yerba mate, vitamin C & ginseng. With 100% NRV vitamins B6 and B12, which contributes to the reduction of tiredness & fatigue, in every tea bag. 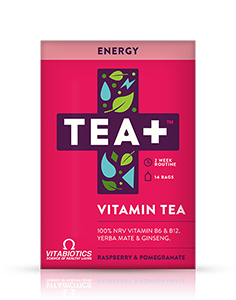 Blended with natural raspberry & pomegranate flavours. We recommend drinking at least one cup of TEA+ Energy per day as part of a healthy lifestyle. The recommended daily limit is 4 servings (200ml per serving). TEA+ Energy contains Mannitol, which is derived from corn, which is a part of our blend. However, the tea is categorised as gluten free under EU regulation. The content of the wheat is in such a small quantity that it is below 20 PPM (parts per million) which constitutes safe for those following a gluten free diet and coeliacs. 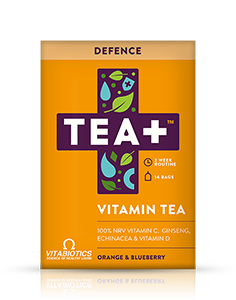 TEA+ Energy vitamin B complex and vitamin C. If you wish to take additional multivitamin supplements, the extra vitamin C and B complex content would be within safe levels.